Has been a while since I did not updated the blog. Since beginning 2018 the world economy, started a downtrend pattern. Even though US market still was not in downtrend, the rest of the world indices were already half a year in downtrend. Because of this two technical reasons I was expecting at the beginning of the year a retracement in all financial market (but US still does not started). Apart from that there are other factors, like the US debt cost is getting higher, interest rates in US are skyrocketing and sooner or later problems should appear. If we check the US debt interest rate (in 10 year T-Bonds which is the most common T-bond and is a reference for many credit). The 30 year T-bonds is similar to 10-year too. 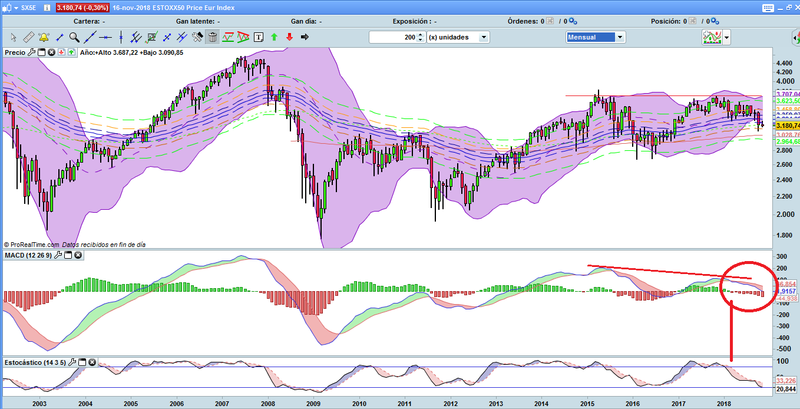 In US index (SP500) for instance, on the monthly chart still cannot see any downtrend, but in the weekly chart something interesting appears. All this being said, there is political risk with the biggest GDP countries and the trade war, it will increase uncertainty and most probably inflation in US (forcing the FED increase pace). But playing the news is impossible, just have in mind this could happen. If the world economy pace stops (and with the trade war between US and China could happen) the oil prices will go down a lot, cause stopping oil production will not be imminent, so same pace of oil production will persist meanwhile economy stops. The crude price for instance has fallen since September from 74$ approx the barrel to 56$ the barrel, a 25% down from September highs due to overproduction (or decreasing consumption in economy in my opinion).